Like the skin on a cooked pudding. But I'm always hungry for news "West of the Pecos" as they are fond of saying, so I was delighted when the "assignment" phone rang in the employee's lounge and Brewster handed me the receiver. It was a call from volunteer correspondent Lou Ann Herda calling from downtown Wink to ask if I needed anything from Winkler County. Although West Texas is normally Brewster's turf, he didn't argue when I told him the subject was sidewalks. Brewster has trouble with concrete thought; so the story was mine. I had personal interest in Wink's sidewalks since 2001 when I read an article in 1968 Time Magazine (I'm really behind with current events). The piece was written when Urban Renewal was going full tilt and was going to solve all of the country's domestic problems (even while Vietnam was solving our foreign problems). The Government let it be known that funds were available for property buyouts and the demolition of old buildings - anywhere they could be found. The details of replacing these buildings hadn't quite been worked out yet; but that certainly wasn't any reason not to get started. 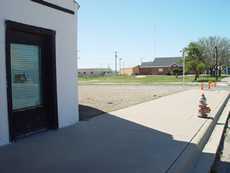 The offer caught the eye of an alert West Texan who applied for some of these funds. He had to have been surprised when he heard that Wink qualified as a perfect example - the "poster child" for Urban Renewal in Texas. 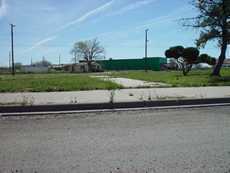 $1,000,000 was awarded to raze dilapidated and/ or dangerous structures plus install new infrastructure for future growth. 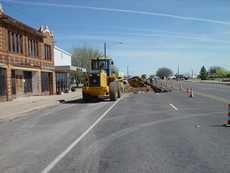 Roadwork in Winkler County is often done without flagmen or pilot cars. A sidewalk leads to another urban renewal success story. It's not to say that the money was wasted. Many of the demolished buildings were little more than ramshackle corrugated tin-roofed structures with shared walls (leftovers from Wink's oil-driven heyday). There was nothing wrong with the installation of infrastructure, either. 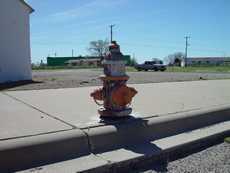 Fire hydrants arrived all bright and shiny and were unwrapped like so many Christmas presents. Everything arrived as promised. And being 1968 - everything was made in USA - no Bangalore manhole covers here. The whole operation was a tremendous success - except for one minor point. Nearly the whole town had left. The Rig Theatre sits across a river of fresh asphalt. Doorway of Wink's Chamber of Commerce. After the moneys were given out, all that was left was a few blocks of buildings. 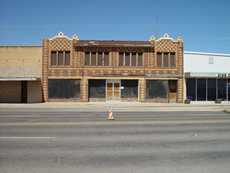 These included the Rig Theater, the chamber of commerce and the building that was to become the Roy Orbison Museum. These buildings now form the core of present-day downtown Wink. 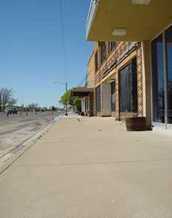 It may have become a ghost town; but it had the best sidewalks money could buy. They're as flat as slate pool tables and as unblemished as any sidewalk that ever appeared in a Disney cartoon. Mother nature has provided specimen examples of West Texas flora. Despite it being a less than optimum time of day, Lou Ann's photos show that these satin-smooth sidewalks seem to extend to the horizon. 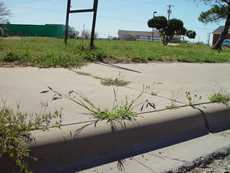 Mother Nature has decorated some cracks with specimen West Texas flora, but other than those little "bumps in the road" it's a skateboarder's paradise. Two words to the Wink chamber: "Championship Skateboarding." Official notice from the Texas Historical Commission. 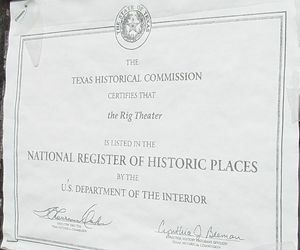 The Rig Theater (a handsome survivor of Wink's heyday and one of the rare Texas theaters from the 20s) has been listed on the National Register of Historic Places. The plaque may be on order, but until it arrives, an official paper notification has been stapled to the plywood. Next time you're in West Texas take a little time to visit Wink. Call ahead and they might open the museum for you. It's a chance to go back in time and walk sidewalks that have remained virtually untrodden since they were installed.